The Honeywell E-Class is a family of printers comprising variants to meet extensive needs Basic, Advanced, Professional and Professional. 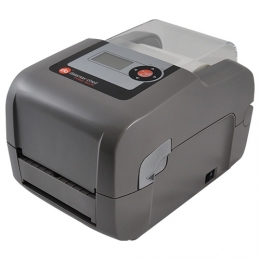 They are scalable from the basic direct thermal variant with USB and RS232 up to the Professional thermal transfer printer with extended connectivity via Wi-Fi and Bluetooth, graphical LCD display and a holder for consumables with a larger outer diameter. Tailored to every purpose there is a suitable assortment of hardware and features, so that you only pay for what you need. The E-Class accommodates label rolls with a maximum outer diameter of 183 mm for longer operating times without having to replace consumables so often. Print high quality labels with up to 300 dpi at a speed of a maximum 152 mm per second. Thanks to the identical construction of the printers in this series, users are spared a familiarization period and personnel training, no matter with which functionality the printer comes equipped. Depending on the variant you retrofit the printers with Wi-Fi, Bluetooth, a peeler or cutter directly on-site.